Cat Zingano’s night came to both a disappointing and frightening end during the UFC 232 FS1 prelims when her bout against Megan Anderson was stopped in the first round when an attempted head kick from Megan Anderson resulted in a toe directly into the eye of Zingano, causing the war-hearted Zingano to retreat against the cage, unable to fight on. 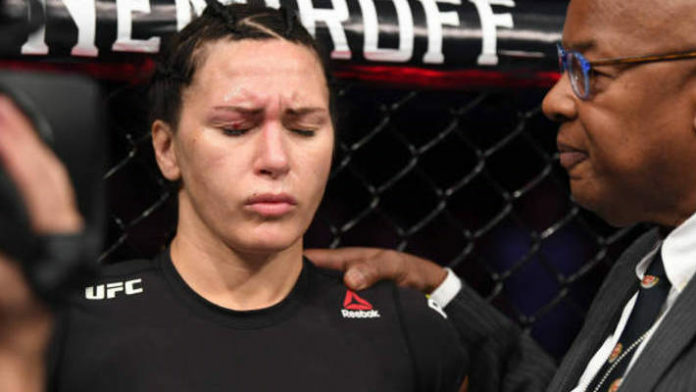 “I have a damaged iris, damaged retina, hemorrhage in the back of my eye, increased globe pressure and of course the laceration,” Zingano said. “They want me back at the doctor every three to four days to make sure there’s no detachment on the retina.” Zingano also told ESPN that she is considering filing an appeal for the outcome of the bout. Cat Zingano is well-regarded for her toughness both physically and spiritually. While her official record for 2018 is 1-2, the upside is she was able to have her most active year in her UFC career, and you can expect the hungry Cat to get right back in the prowl in 2019 as soon as doctors will permit. Do you believe Cat Zingano has a legitimate case for an appeal?